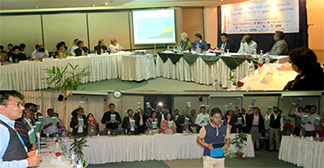 CHS support group Bangladesh organized a seminar on February 11, 2016 at BRAC Inn in Dhaka after translating Core Humanitarian Standard (CHS) in to Bangla within an inclusive and participatory process. CHS support Group is an informal group representing different humanitarian agencies, academia, sector expert individuals and others. In the seminar Judith Greenwood, Executive Director, CHS Alliance, Geneva expressed her gratitude all for the involvement of translation the standards in local language. She also appreciated that this will assist the grass root staff and affected beneficiaries for better understanding and implementation of the standards in their programs. Previous articlePolitical Commitment is Necessary among All Parties for Sense of Security to Reduce Illicit Financial Flow.